Former NFL wide receiver who played thirteen seasons with the New York Giants. He won a title as part of the 2007 Giants team that upset the New England Patriots in the Super Bowl. He was voted first-team All-Big Ten as a wide receiver at the University of Michigan. He became a host on the NBC Sports Radio Network when the station launched in 2012. He is the nephew of comedian George Wallace. He was longtime teammates with Giants quarterback Eli Manning. 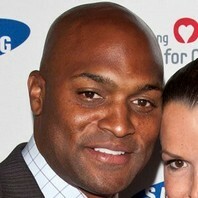 How much is Amani Toomer worth? I just noticed in the #NDvsCLEM game. When did #NDFB #NDFootball start putting last names on their Football Jerseys? I don't want to get into my emotions. Eli just threw a great ball and gave me an opportunity to make a play in it. It was just a fade [pattern]. The ball was in such a good spot. And I made a play.